After twenty-plus hours of flying and transit, we arrived on a tiny island in the Indian Ocean to the smell of salty air and the sounds of Maldivian drums accompanying an inviting chant: “Wel-come to…Ko-man-doo. Have a nice…hol-i-day.” It was a rhyme Chris and I repeated throughout the week with affection for our temporary home in absolute paradise. And have a nice holiday we certainly did, thanks to the ultimate relaxing environment of Komandoo. The pampering commenced immediately as we were greeted and handed a cold towel, a fresh coconut, and a scoop of homemade coconut ice cream. Paradise. There is really no other word to describe our surroundings. Everywhere we looked, we felt like we stepped right into a postcard. I photographed the same scenes over and over, hoping to capture at least a fraction of the magic and to do this utopia justice. In my last post I detailed how we ended up choosing to stay at Komandoo, and in this two-part review I’ll cover a full report of our time at the resort. Situated in the Lhaviyani atoll, Komandoo is a 40-minute seaplane transfer going north from Malé. Resort accommodations consist of fifty beach villas and fifteen water villas, so compared to the majority of Maldivian resorts, Komandoo is on the smaller side, which is exactly what we wanted since we were craving a quiet, laid-back experience. The island itself stretches less than a kilometer lengthwise and it’s even shorter across the width. 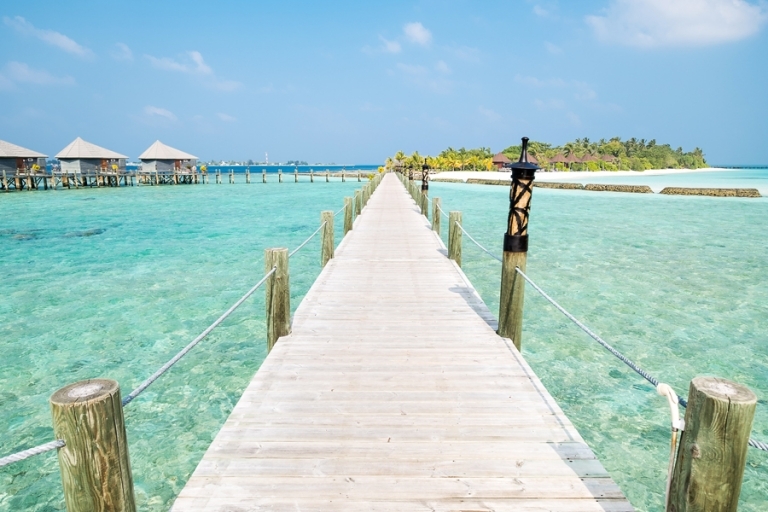 The beach villas line either side of the island, tucked into the lush foliage, and a half-moon of water villas curve around the end of the island, connected by a wooden jetty. I noticed right away how immaculate the island was at every turn. As if by magic, though I know it’s due to a lot of hard work from the grounds staff, all of the pathways and beaches were perpetually free of debris and trash. The overall aesthetic at Komandoo is well-manicured but natural. Almost every nook of the island is dedicated to making this a magical and peaceful place for guests, from the major amenities like the beach bars, restaurants, and spa, to the smaller touches like hammocks and wooden swings throughout. This is an island that evokes instant relaxation and wellness, and it literally invites you to put your feet up at every opportunity. One of my many favorite things about this trip is that I didn’t suffer even one bug bite thanks to the care of the grounds crew (they treat the area on a regular schedule) and maybe also to the luck of having a breezy week. We spotted a few cute crabs and small lizards around the island, but aside from one bee at lunch and a few tiny ants after we left a cookie sitting out in our room (our fault, we know better), we never saw any bugs or spiders. At night the island glowed courtesy of beautiful lanterns and tiny sparkles along the beach that mimic the water’s bioluminescence. Now I want to gush about our villa and how happy we were with the choice to stay in one of Komandoo’s Jaccuzi Water Villas. 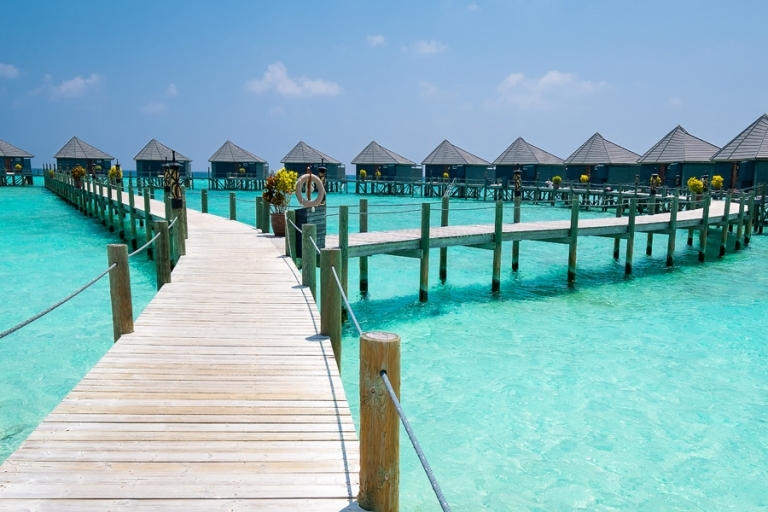 The novelty of a bungalow perched right over the jewel-toned water of the Maldives claimed a spot on our bucket lists a while ago, and we decided to splurge a bit on this trip by booking one of the resort’s fifteen water villas. At 77 square-meters, Eagle Ray #9 provided more than enough space for us with plenty of storage, too. We were actually a little surprised at just how big the villas are, especially when you factor in the oversized bathroom and the huge deck with steps that lead directly into the ocean. Our amazing room attendant took great care of us the entire week. Fresh towels transformed into animal art topped our bed each day, mini bar staples and bottles of water were replenished daily, and nightly turndown regularly included sweets along with special treats on Valentines Day. The lavish bathroom offered a giant Jacuzzi tub, double sinks, a spacious shower, and a separate water closet. Thoughtful touches included toiletries and plenty of places to hang wet towels and swimsuits. Bonus: you might laugh, but I marveled over the privilege of being able to flush toilet paper in our bathroom. Some of the Caribbean island homes we’ve stayed in (even on the more upscale side) don’t always have that luxury! While we had gorgeous skies almost the entire trip, we did encounter an unusually windy week on the island. 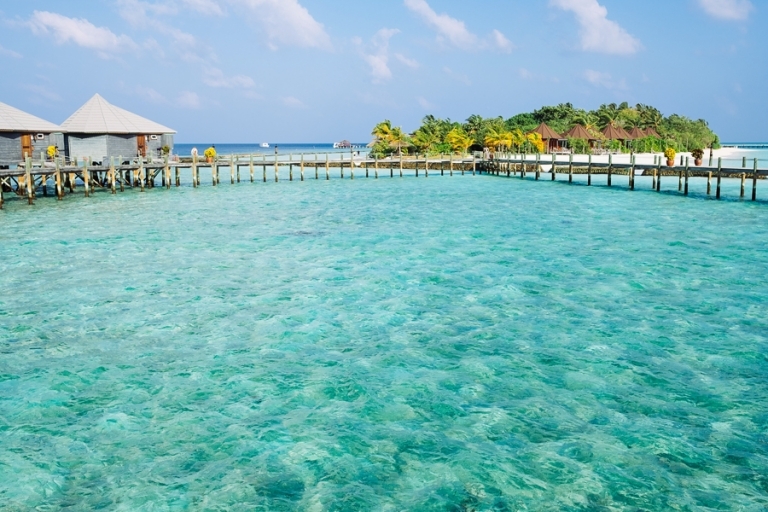 As a light sleeper, I sometimes noticed a slight shimmy in the villa at night, and I could often hear the water slapping against the steps and the stilts, but I quickly became used to water villa life and managed to get a pretty deep sleep most nights. Our king-size bed felt supportive and cozy, and it was always a welcome respite after a day of fun in the sun. The WiFi signal wasn’t always the fastest, but we were able to check in with friends and family back home and upload a few photos. It was enough to feel connected, but also slow enough to encourage us to disconnect, which we definitely needed! And as hot as it gets during the day, it’s worth mentioning that the air-conditioning kept us perfectly comfortable whenever we needed it. Our favorite part of the villa was easily the outside space. The design and layout of the water villas ensures that each guest has ample privacy. To take full advantage of the outdoors, we treated ourselves to room service for breakfast on most days (more on Komandoo’s food in the next post). Starting our day by enjoying a delicious meal on the deck, gazing out onto the Indian Ocean became one of my favorite daily rituals. Any time we got a little too hot, we descended the stairs right into the water to cool off. It felt like stepping into an aquarium – we found several coral heads and tons of colorful fish only a few meters from our villa. We even spotted an eagle ray gliding along the lagoon one afternoon. Chris and I have become avid snorkelers over the past few years and have had the opportunity to explore some of the world’s best snorkel sites, so having a good reef topped our resort requirements list. Fellow travelers mentioned Komandoo frequently on travel forums with regards to a good reef, and we can now wholeheartedly agree! On one side of the island, the reef was super easy to reach – from the sunset beach bar we could enter the shallow and super clear lagoon, and swim a few meters past the barriers and then through a cut in the reef. We did this routine a couple of times since it was quick access from our villa. I did notice a bit of coral bleaching, but from recent reports it sounds like the reef is well on its way to recovery. On the other side of the island, the swim out to the reef was a bit longer, but with the reward of a huge section of healthy coral teaming with fish. We snorkeled most days, and it was amazing to see a few new-to-us fish for the first time: unicorn fish, Maldives anenomefish, and an eel. We hung out with one of Komandoo’s resident turtles one day, and we always loved walking along the shore accompanied by baby black tip reef sharks. I miss everything about the island, and I can’t wait to return again someday. Now that we are back home in the States, we occasionally find ourselves chanting fondly: “Wel-come to…Ko-man-doo. Have a nice…hol-i-day.” Thankfully I get to relive our trip by writing about the experience! In part two of my review I’ll talk about Komandoo’s service, activities, and food. Stay tuned! Susan - Thank you, Adrienne! It was a spectacular island and reef, indeed! Susan - Marilyn, that’s so wonderful! I think you’ll absolutely love Komandoo! Have an amazing time (I know you will).